A Beginners Guide: Styles of Jewelry with John Colasacco | Skinner Inc. There is a certain level of satisfaction that comes with wearing vintage and antique jewelry that just cannot be contested with present-day makes. For instance, clasping a Cartier bracelet around ones wrist that was forged for the likes of Hollywood stars such as Sofia Loren, Elizabeth Taylor and Audrey Hepburn conveys an air of tribute and elegance that demands prestige. Vintage and antique jewelry contains the histories and creative eyes of the times it was defining – adding a special dash of interest that just isn’t inherent in contemporary styles (yet). Familiarizing oneself on how to tell styles like Art Deco, Edwardian and Art Moderne apart, not only makes for a clever conversation starter, but it makes browsing through auction catalogs much more exciting. One of the key elements of Art Deco (1920s – 1930s) jewelry is the use of geometric patterns and linear design. When trying to identify the style, I like to ask “does this remind me of the Chrysler building?” You’ll see various stylized motifs, as jewelry designers from this period transformed naturalistic forms into circles, ovals, rectangles, and squares. 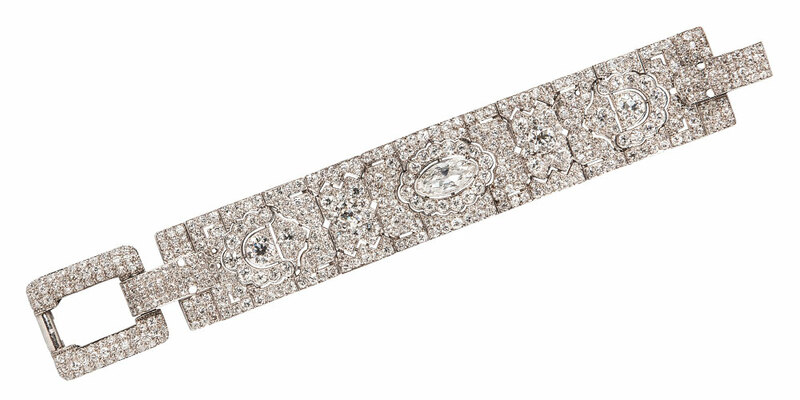 This Cartier bracelet is a quintessential example of an Art Deco strap bracelet, composed of geometric panels showing stylized lotus motifs and finely pierced platinum work, and completed by a buckle and clasp motif with pave-set diamonds. What I love about antique (100+ years) jewelry is the old cut diamonds. The cut of a diamond or gemstone can help you determine its age. Older cuts tend to be more “lumpy” and cushiony, with smaller tables and steeper crown angles. 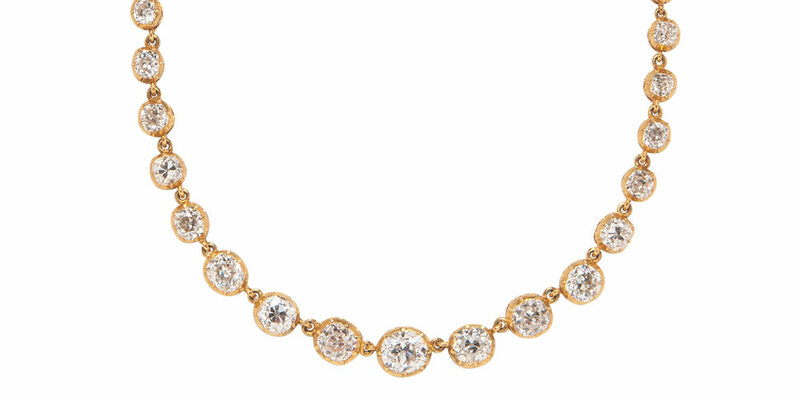 While the majority favors the modern round brilliant-cut, I love the way old mine-cut diamonds sparkle! This diamond riviere, a necklace of graduated gemstones, and likely dates to the mid-19th century, is set with approximately 32.00 cts. of old mine-cut diamonds. You also need to look at the way the stones are set- these diamonds are in crimped bezels rather than open prongs. 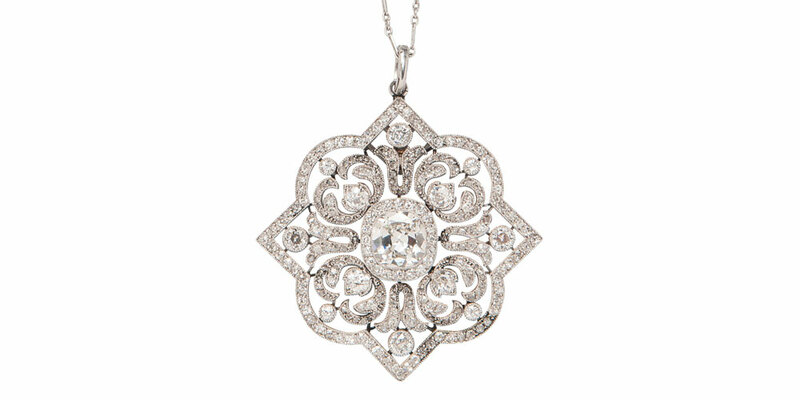 The simplicity and elegance makes this a fantastic piece of antique diamond jewelry. I look at Art Moderne (1930s) jewelry as not quite Art Deco, and not quite Retro. Retro jewlery is often big, bold yellow gold. Art Moderne is hugely influenced by the Machine Age, and you can immediately see the difference between the Art Deco Cartier bracelet discussed above and this one here. Art Moderne jewelry and style look at machine parts, and the platinum tubogas, or, gaspipe chain is in stark contrast with the geometric Art Deco plaque links. 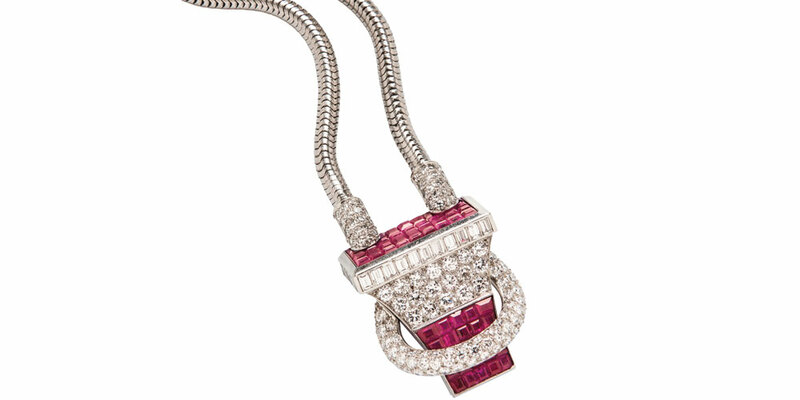 I also love the sleek design of the central element with invisibly-set rubies. Edwardian (1901-1915) jewelry is where you really start to see jewelry in platinum. While platinum had been used prior, the invention of a new torch in the late 19th century allowed the material to be worked with less difficulty and the garland style really evolved. Edwardian jewelry typically consists of garland motifs and finely pierced lacework. It is elegant and delicate, and this pendant has delicate scrolling foliate motifs typical of this period. Georgian (1714-1830) jewelry has been quite popular in recent years. You typically expect to see silver-topped gold, and gemstones backed by colored foil to enhance the color due to the nature of cutting techniques. One element of 18th century fashion that I love is the waist-hung watch or etui. 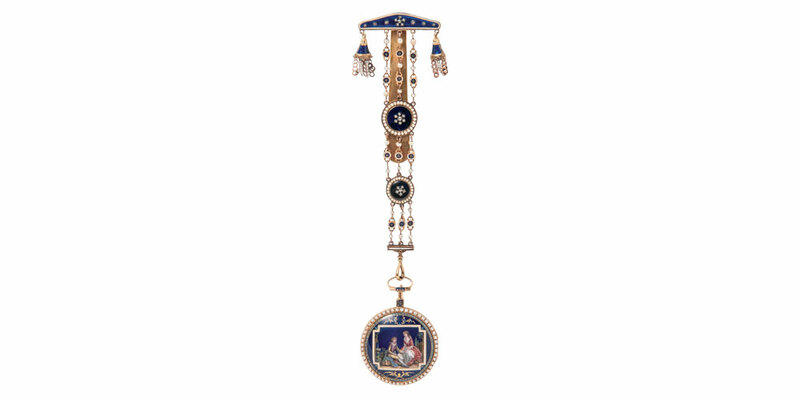 This chatelaine watch is lovely, and is of the typical form with a central watch, and would have had shorter side chains for a key, seal fob, or other trinkets. They were often elaborate and highly decorated, and would have adorned the most fashionable of Georgian ladies. Click here to view Skinner’s upcoming Important Jewelry sale on September 25th. Click here to view Skinner on Bidsquare. 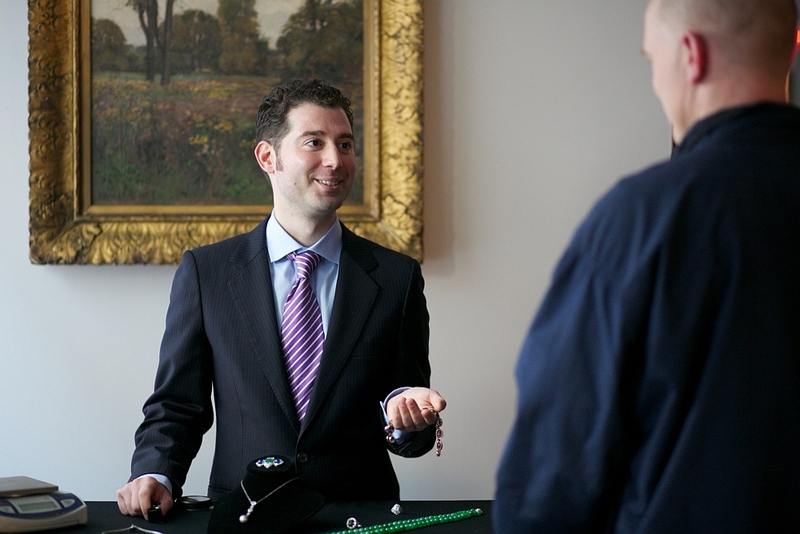 Watch John Colasacco appraise an antique Tiffany & Co. ring on Antiques Roadshow PBS! This entry was posted in Blog and tagged antique jewelry, art deco jewelry, art moderne jewelry, Edwardian jewelry, fine jewelry, Georgian jewelry, jewelry auction, John Colasacco by Kerry Shrives. Bookmark the permalink.